Love rhymes? Love Dr. Seuss? 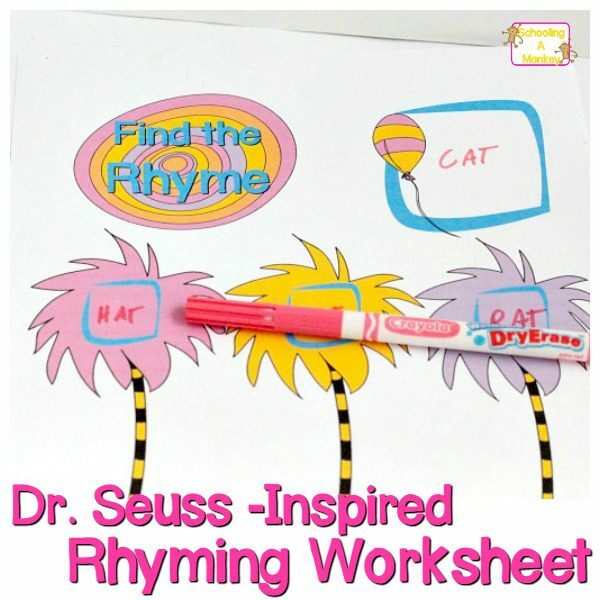 Kids will love these rhyming Dr. Seuss worksheets inspired by the classic children’s book author! Never-ending rhyming fun! 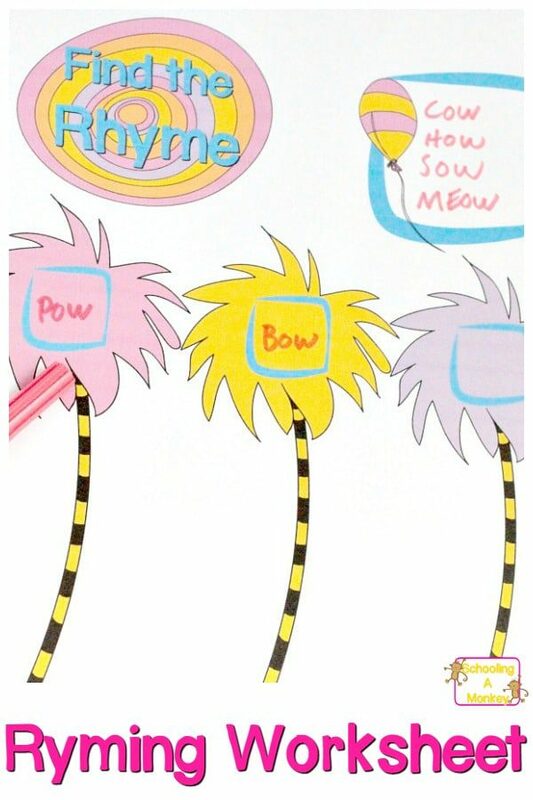 For some reason, the concept of rhymes stumped my kids for a long time. Monkey was in third grade before she really understood the concept. Bo is following right in her footsteps, so I made this quick little wipe-away printable Dr. Seuss worksheet inspired by the famous author to hopefully help Bo learn rhymes before she is eight. We laminated our worksheet so we could use it over and over! Use this printable along with your other lessons for a Dr. Seuss thematic unit. This worksheet is so simple to use, but the uses are nearly endless! For older kids, try to find rhymes for harder words, like “alligator.” Little kids will love making rhyme strings with simple words. First, print the worksheet onto regular computer paper. Next, slide the worksheet into a laminating pocket and use your laminator to seal the edges shut. I was lucky enough to get this laminator for Christmas, so we’re going on a laminating spree at our house. Laminate everything so you only have to print it once! We use fine tip dry erase markers so it they act more like pencils and pens for little fingers and so you can still read what you write. When you’re done with one set of rhymes, wipe the sheet clean and start again! 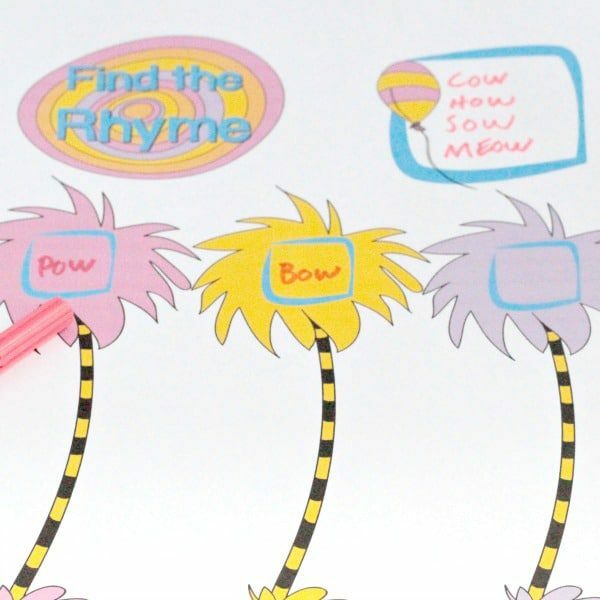 Come up with fun rhymes and watch the little wheels in your kids’ brain turn! It’s fun to challenge kids to come up with rhymes for harder and harder words. This is a great exercise for expanding the vocabulary of your kids! Build a Complete Dr. Seuss Unit Study! Get more unit study ideas here! 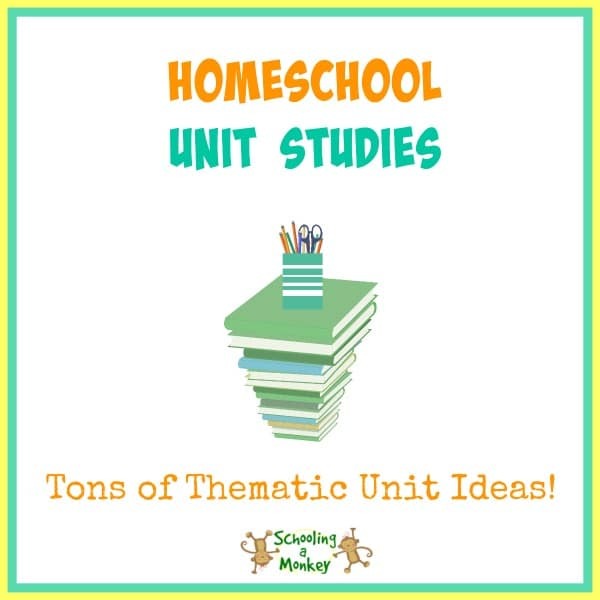 Get more ideas for Free Unit Studies with 100’s of topics and activity ideas!